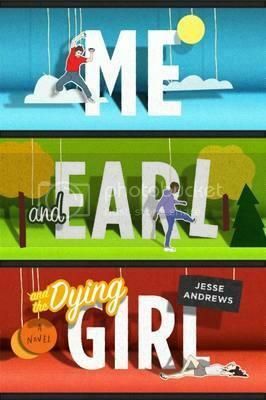 Me and Earl and the Dying Girl by Jesse Andrews (review copy) - Greg Gaines is the last master of high school espionage, able to disappear at will into any social environment. He has only one friend, Earl, and together they spend their time making movies, their own incomprehensible versions of Coppola and Herzog cult classics. And all at once Greg must abandon invisibility and stand in the spotlight. From Goodreads. When I was offered a copy of Me and Earl and the Dying Girl by Jesse Owens, I was told that the book had been adapted for the big screen and would be shown later this year. Seeing as it had rave reviews for being very funny, and I love reading books before seeing the movie, I jumped at the chance. And those rave reviews? Well this is about to become one of them. Greg is in his senior year of high school, and has perfected the art of invisibility; be on friendly acquainted terms with every group clique without being a part of any clique - and don't let any clique see you with another. This means Greg has no real friends, but he doesn't have any enemies either. Oh, well, there's Earl, but Greg would tell you he's more of a co-worker than a friend. They make movies together, remakes of cult classics. That is Greg's life; avoid everyone at school, make movies with Earl. But when his mother tells him that someone at school, Rachel, has Leukaemia, and that he has to go and hang out with her to make her feel better, his life gets turned around. Suddenly he has a friend, and his invisibility is gone. He's faced with the awfulness of cancer, and the responsibility of making this sick girl laugh. When it's suggested he and Earl make a movie for her, things get even worse. I cannot tell you just how hilariously funny this book is. It is unbelievably funny, especially considering the dying-girl-with-cancer. This is not a sad, poignant, heart warming John Green novel. This is down to Greg - Greg who has this really unique voice, who has a talent for comedy. Everything he says, or narrates, had me smiling away, despite the serious subject matter. Put him and Earl together, and oh my god, I was laughing out loud. Earl talks in grammatically incorrect sentences, with a lot of profanity, and can be a little lewd. He comes across as being quite stupid, but he isn't, as we discover towards the end of the book. He was probably my favourite character. Rachel I wasn't that bothered by, to be honest. She was ok, but nothing spectacular. She wasn't very memorable for me, but Greg screwed up quite a bit around her, so there were more laughs for me. Greg is the one writing this book. Although Andrews is the author, the plot is that Greg is writing this book, for unknown (until later) reasons. The book even starts off with an Author's Note from Greg saying how bad this book is going to be, because he's a filmmaker, not a writer. Greg is quite the amateur at writing books. The story jumps back and forth when Greg realises he needs context and back story for something he's talking about; his history with girls, his relationship with Earl, or maybe a pause just so he can explain something for a chapter, so when he goes back to the story, his actions make sense. It's quite a strange style, but I quickly got used to it, and added to the humour. When a chapter started along the lines of, "I guess I should probably tell you about...", I knew I was in for more laughs. But at the same time, I was wondering for quite a while if there was any real plot to this book. It was like Greg just felt like writing about what happened during his senior year. I could see where things were going with Rachel, and that affected Greg's life, but the reason for the story, why Greg was writing it, I just couldn't see. Until the end. The ending of Me and Earl and the Dying Girl is surprisingly beautiful - especially when it comes to Earl, who is a lot deeper and smarter than he seems. You get used to all the laughs and awkwardness, but when Earl lays in to Greg for complaining about something, and tells him he needs to be a better friend to Rachel, who is dying, or when he talks seriously about the future... it's amazing. There is more to this boy than meets the eye - as Greg said throughout the whole book, Earl is smart. I ended up loving Earl even more when we saw this new side to him. I'd love if we got a book about him, and got to know him better. He's just awesome. Me and Earl and the Dying Girl is a brilliant, ridiculously funny story, and this review has come nowhere near to doing it justice. You'll just have to read it for yourself - and I highly recommend that you do. Thank you to Allen & Unwin UK for the review copy. I LOVED THIS BOOK. I mean, I half hated it because the humour was really gutterish sometimes and crude. But I snorted...and I laughed out loud sometimes, which like never happens. Omg, I'm really excited for the movie! And I loved the diversity too! I loved how natural it read and how interesting it was. *nods* Basically this book was pretty dang good, so glad you liked it too!! Yeah, I know what you mean! I took a photo of some of the conversations between Greg and Earl and sent it to my best mate, asking, "Do teenage boys really talk like this?!" They said they never did. But I was a bit surprised! But it was so funny overall. Despite the crudeness, Earl had me in fits! A pretty awesome book :) Hope you enjoy the movie!